SALT LAKE CITY — Bountiful coach Mike Maxwell candidly stated what is at stake for his program. The Braves withstood several runs and ultimately dispatched Olympus 63-54 in the 4A semifinals at the Huntsman Center Friday one year after suffering a heartbreaking defeat by way of a desperation heave from half court in the same round. It wasn’t easy. Despite the absence of injured star Jake Lindsey, who fractured his hand right before the first round, Olympus pestered around like a fly on a hot summer evening. Each time Bountiful established a lead, the Titans responded with spurts. Bountiful got hot from distance in the opening minutes with four straight 3s from Jordan Bleak, Sam Merrill and two from Zac Seljaas, which eventually led to a 20-10 lead after one quarter. Seljaas enjoyed perhaps his finest performance of the tournament with 22 points (9-of-13 shooting), five rebounds and five assists. Merrill finished with 18 points, five rebounds and eight assists, while Bleak, who Maxwell said, “set the tone,” elevated his typical production with 14 points to compensate for Jeff Pollard, who uncharacteristically finished with only two points. After falling behind early, Olympus mustered its first response. The Titans trimmed the deficit to two points, 20-18, on a coast-to-coast layup before John Pettit sank consecutive 3s. The sudden burst of offense was initiated by three Bountiful turnovers on entry passes to the post. Spencer Williams provided Olympus its first short-lived lead, 23-22, on an uncontested 3 shortly thereafter. Bountiful’s Trevor Lloyd, fresh off the bench, immediately pocketed a 3-ball on the opposite end to initiate an 11-2 run to close the first half. Lloyd also contributed to defending Olympus star Alec Monson, along with Andrew Lund. The constant rotation forced Monson into only five field goal attempts and 10 points. Bountiful extended its lead, 37-25, with two straight buckets to start the second half. The first occurred after two offensive rebounds, one more than the Braves corralled in the opening 16 minutes. 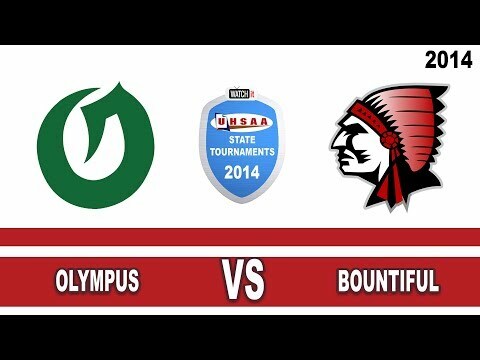 Olympus won the glass 33-24 (22-10 in the first half), an area of concern for Bountiful in Saturday’s championship against Orem. Bountiful’s lead blossomed to as high as 15 points before the Titans embarked on their final surge. Spencer Williams cut the deficit to eight with 6:42 remaining in regulation before Jordan Meacham and Conner Haller connected on two straight 3s to pull within four, 52-48. Afterward, Merrill quickly accounted for six straight points — all at the rim — before Seljaas put the game on ice with a three-point play.